It’s your right. It’s your duty. Do it! It took me just under two hours from the time I arrived at my polling place to the time I walked out the door after having cast my vote. But it was worth every minute of it. You should vote, too. Go! Go! Go! :) Did you use our favorite yarn bag hooked over your arm? Two hours isn’t so bad, I’ve heard of worse. Donna, I do not care who you voted for- the fact that you crochetd in the line to vote makes you my hero of the day! Hooray for Donna! :) I like the dishcloths. :) :P No line for me, although I did bring scarf yarn and a hook just in case. lol, the determination of a crafter! (or craziness…depends on who you’re talking to). 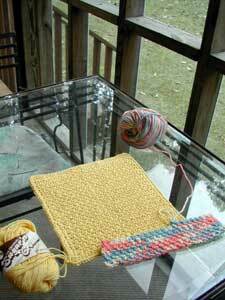 I like the dishcloths, and especially love the colors in the variegated one!